New York, New York (January 19, 2012) - NIKE, Inc. (NYSE:NKE) announced today the NIKE+ FuelBand, an innovative wristband that tracks and measures everyday movement to motivate and inspire people to be more active. Activities can now be measured through a new metric called NikeFuel: the more active you are, the more NikeFuel you earn. NIKE, Inc. President & CEO Mark Parker unveiled NIKE+ FuelBand at an event in New York attended by seven-time Tour de France champion Lance Armstrong, Oklahoma City scoring champion and all-star Kevin Durant and 2011 IAAF women�s 100 metres World Champion Carmelita Jeter. "The NIKE+ FuelBand is a way for Nike to further evolve the exciting possibilities of merging the physical and digital worlds," said Parker. "Nike has always been about inspiring athletes, and the NIKE+ FuelBand will help motivate them in a simple, fun and intuitive way." Designed to be worn throughout the day, the ergonomic, user-friendly NIKE+ FuelBand uses accelerometry to provide information about different activities through movement of the wrist via a LED dot matrix display. Four metrics are available: Time, Calories, Steps and NikeFuel. Unlike calorie counts, which vary based on someone�s gender and body type, NikeFuel is a normalized score that awards equal points for the same activity regardless of physical makeup. Armstrong said, "What�s great about the idea of NikeFuel and the FuelBand is the way it provides real information and numbers to show how much people are doing all day, every day. That�s what will get people challenging themselves to do more and better their own scores. It�s a tool to get people more active." "NikeFuel means everyone can get recognition for activities they do," said Durant. "It provides a scoreboard for your day and gets everyone moving." Jeter said, "You don't have to be an elite athlete to appreciate how NikeFuel can motivate you. It�s an easy way to get credit for activities and compare how you do with others, even if you take part in different sports. 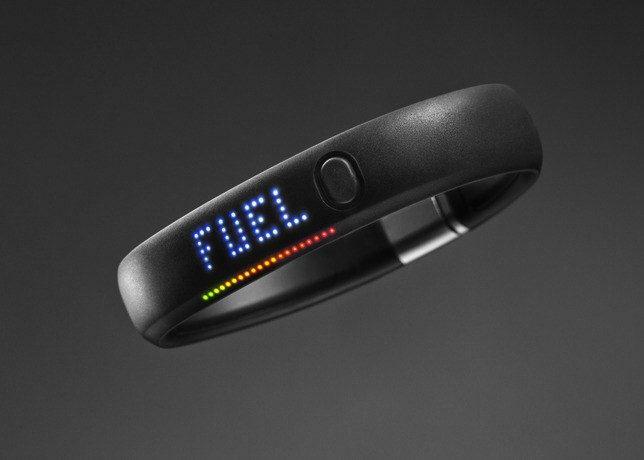 The Nike+ FuelBand will be available in the UK from the 1st May, RRP £139 (GBP).